The map measures 19.5 inches (49cm) by 28 inches (71cm). It is printed in four colours and is double sided on firm glossy paper. On one side at a scale of 1:70,000 is shown the whole of the Somme battle area from Bullecourt in the north to Amiens in the south and from Doullens in the west to Péronne in the east. 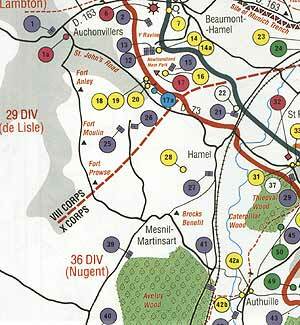 Also on this side are the colour coded indexes and the map of the 1918 sector from Villers Bretonneux to Cantigny. On the other side at a scale of 1:40,000 the battle area mostly, but not exclusively, associated with the 1 July 1916 operations is shown in great detail. Also marked are the front lines of 1 July 1916 giving the Army, Corps and Divisional boundaries for the British forces including their Commanding Generals. 1914/18 place names are marked in red, heights over 140m are shaded in grey clearly showing the barrier of the Thiepval - High Wood ridge and significant woods are coloured green. The map is overlaid with a grid reference system which is common to all of the maps and allows the large amount of information on the map to be accessed quite easily. 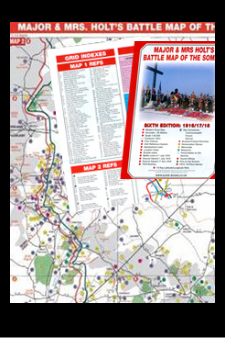 This is done using detailed indexes and while the map can be purchased and used entirely on its own, the map references tie up with the stops/visits recommended in Major and Mrs Holt’s Battlefield Guide to the Somme. This map is actually wrapped with the book. There are two types of Index. 1. Location. Thus upon seeing a marker on the map at grid K40 the Grid Index shows it to be the Liverpool/Manchester Pals memorial.